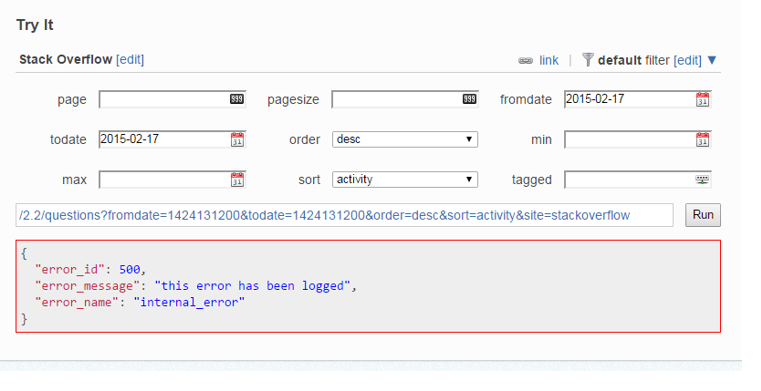 When using the Stack Exchange /questions API using the same date for fromdate and todate I get a 500 internal server error. Using different dates appears to work OK but specifying the same value causes an error, I will try to apply a work around but can this be fixed? See the error at the /questions doc page. -- rather than an error. Having the dates be equal is theoretically possible. Having negative time is impossible (in this context). However, having the same date may not mean what you think it means. You probably want results from 2015-02-17, 00:00 AM to 2015-02-17, 12:59 PM, but the "date" parameters are really unix epoch time, so your sample query is giving you just 2015-02-17, 00:00 AM to the nearest second (Which could have valid results, but not what you probably expect). To work around this issue, and to get a day's results, set the fromdate to the day you want and set the todate to the next day. EG: 2015-02-17 and 2015-02-18. The API erroneously gives an error (and an unhelpful one too) if fromdate and todate are the same, but it also appears to give errors if they are not different by at least 100 seconds! 1424044800  1424044800  "Violation of backoff parameter" !!?!! Not the answer you're looking for? Browse other questions tagged bug api questions api-v2.2 date .